A long term traveler and aspiring writer and photographer. To see more travel photos visit my page at Instagram/living_a_different_style. The Floralis Genérica surrounded by lush parklands in Buenos Aires. 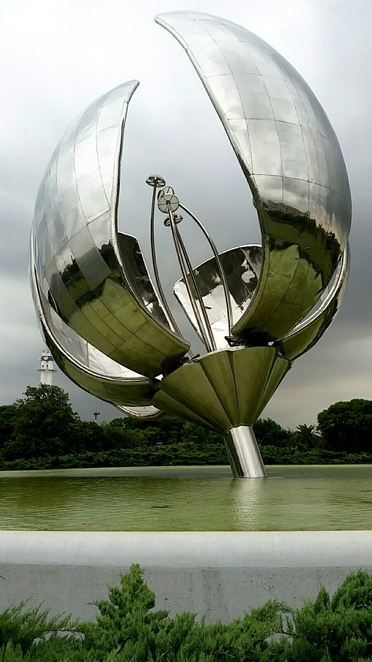 The Floralis Genérica, an 18 ton, 23 m high stainless steel flower that opens at dawn and closes at dusk. A fascinating moving sculpture located in the Plaza de las Naciones Unidos surrounded by lush gardens and overshadowing a reflection pool. I had heard of this enormous sculpture and was interested in watching the great petals closing at the end of the day. Arriving in the park I was greeted by a great number of tourists and Portenos (what the locals of Buenos Aires are called). Children were playing in the shadows of the mirror like petals and adults reclined on strategically placed benches within the park. A place of peace and reflection. As I selected my seat I in anticipation of the oncoming show, I engaged in a conversation with a fellow park goer. Shortly after I was advised that unfortunately the electronics of the Floralis Genérica were disabled and it would not be closing this evening. One learns to accept that this is an intrinsic part of Argentina, the delays and unexpected are simply a part of everyday life. 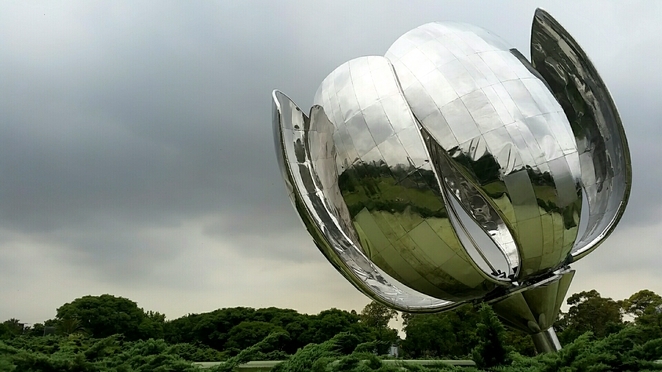 Eduardo Catalano, an Argentine architect, gifted the Floralis Genérica to the city of Buenos Aires in 2002.The structure was designed to signify a rebirth of hope every day with the opening and closing of its giant petals. The name Floralis represents "belonging to the flora and therefore the flowers", and Genérica "from the concept of "gender" and indicates that it represents all the flowers in the world". The electronics have been a ongoing problem since the inauguration of the structure due to a problem with the installation of a petal. In 2010 the electronics were disabled and the petals were left permanently open in order to prevent damage to the sculpture. It was repaired and functional again in 2015. Why? It is an impressive piece of engineering.